Biopsy of parathyroid adenomas can be dangerous and is almost always unnecessary. Parathyroid glands should almost never be biopsied (FNA biopsy). Fine-needle aspiration (FNA) biopsy of parathyroid adenomas is a procedure we would love to see disappear! One of the parathyroid operations that I performed this week that really stood out from the others was in a wonderful, somewhat chatty lady from New Jersey. Her PCP noted that she had high calcium and correctly proposed that the high calcium was why "Little Miss Chatty" was feeling so tired all of the time. She was sent to an endocrinologist who ordered "about 20 test tubes of blood" and a couple of scans so they "could find the tumor for the surgeon." The diagnosis of primary hyperparathyroidism was easy to make actually: her blood calcium level of 10.8 was obviously high and her parathyroid hormone (PTH) level of 116 was far outside the normal range. Well, the sestamibi scan showed the parathyroid tumor, but her endocrinologist wanted to give her local surgeon a helping hand by performing a needle biopsy (called a Fine Needle Aspiration Biopsy, or FNA) to PROVE it was a parathyroid so that the surgeon would know where to look for it in surgery. So an ultrasound was done, and the parathyroid tumor was punctured with a needle, sucking out some fluid and cells to send to the lab to confirm what is, frankly, already known: there is a parathyroid adenoma in "Little Miss Chatty's" neck! Parathyroid surgery was a simple solution… right up until the needle-stick. Fine-needle aspiration (FNA) biopsy of a parathyroid tumor causes fluid to seep out of the tumor and stick to everything around it. Now this makes parathyroidectomy (a routine, outpatient, safe, simple operation) into a technically difficult, risky challenge, to say the least. When this doctor was trying to "help" the surgeon, she actually made the operation 10 times harder, twice as long, and increased the risk for injury to the nerve to her voice box during the operation. Our group published an important paper on needle biopsy of parathyroid glands several years ago (see footnote below). In this paper we described how much more difficult parathyroid operations are when the parathyroid tumor has been stuck with a needle! Fine-needle aspiration (FNA) biopsy of parathyroid adenomas causes intense scar tissue that makes the adenoma stick to the surrounding anatomy. Is that so bad? Well, yes. When the surrounding anatomy is the nerve to the voice box (ie., the recurrent laryngeal nerve), it can be very dicey. The recurrent laryngeal nerve doesn't particularly like for you to blow it a kiss, much less peel a scarred tumor off it! Naturally, FNA thus adds time to an otherwise quick procedure, because we have to tiptoe around this nerve when it would usually be brushed away from possible harm with a single swipe of a cottonball. Another problem with sticking a parathyroid tumor with a needle (FNA Biopsy) is that the scar reaction from the needlestick also makes our pathologist think they are looking at parathyroid cancer under the microscope. Who could blame them? Parathyroid cancer (the rarest of rare cancers) looks just like this-scarred and stuck to things around it! 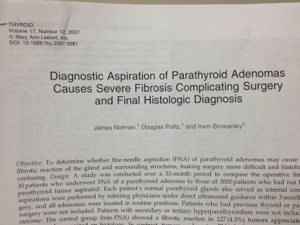 Starting to sound like that simple FNA biopsy of the parathyroid adenoma wasn't so helpful after all? We have learned to avoid patients who have had their parathyroid biopsied with a needle, and have on occasion refused to take patients into our practice that have had this done. The problems this can cause in some patients cannot be overstated. In this case, I removed her tumor in 26 minutes (a little longer than our average time of under 20 minutes), but it was time well-spent: Little Miss has a normal voice and remains chatty! Parathyroid biopsy article published in 2007 by Dr Politz and partners. Norman J, Politz D, Browarsky I. Diagnostic aspiration of parathyroid adenomas causes severe fibrosis complicating surgery and final histologic diagnosis. Thyroid. 2007 Dec;17(12):1251-5.